The Chain O’Lakes, located in North Eastern Illinois, is 15 lakes interconnect by a series of channels offering over 200 miles of continuous shoreline. Lakes included on the Chain are Lake Catherine, Channel Lake, Lake Marie, Bluff Lake, Spring Lake, Petite Lake, Fox Lake, Long Lake, Grass Lake, Nippersink Lake, Dunn’s Lake, Pistakee Lake, Lake Matthews, Red Head Lake and Lake Jerilyn. The Fox River is navigable from Wilmot Wisconsin through the Chain O’Lakes, south to Algonquin Illinois. 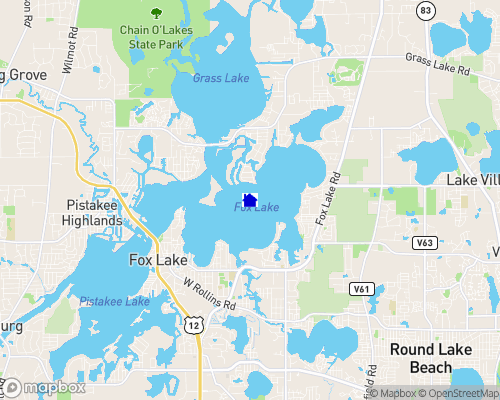 The Chain O’Lakes and Fox River offer many recreation possibilities; motor boats, sail boats, wave runners and jet skis are all permitted with no horsepower restrictions. Various sandbars offer a place to anchor your boat and swim; or visit the numerous restaurants and clubs. Winter months offer snowmobiling, ice skating and cross county skiing; or fish and hunt year around. Water depths range from 3 to 42 feet depending on the lake. All waterfront homes are allowed private piers. The Chain O’Lakes is located midway between Chicago, Illinois and Milwaukee, Wisconsin, approximately 50 miles from each city’s international airports. Information provided by All Waterfront Real Estate Plus.